AppsCenter is the first plugin that gives you the ability to access all the apps you want right from the Notification Center. You have tons of Settings that allows you to organize your apps or slightly customize the appearance of the widget. 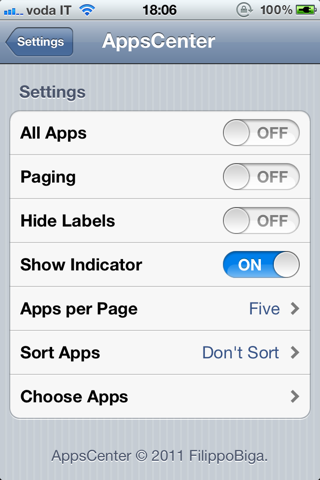 For example, you can toggle labels for icons and the scroll indicator, or sort apps by name or category. You can also decide to put all your apps inside the widget, by enabling the correspondent option from Settings. Otherwise, you can choose an unlimited number of apps from the one you have installed. 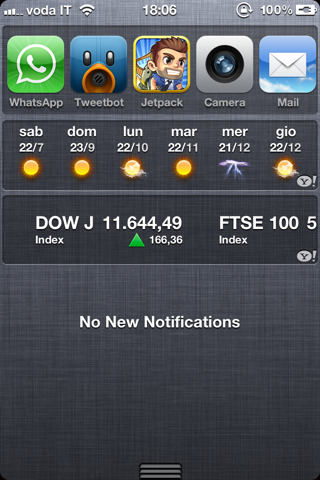 You need to enable the widget from Settings > Notifications before seeing it in the Notification Center. Now Playing information in the Notification Center. 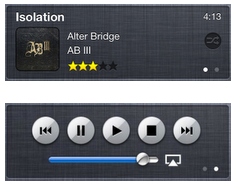 You can control the iPod right from this widget as well as tweet the current song thats playing. There are several preference options included for the tweeting feature. 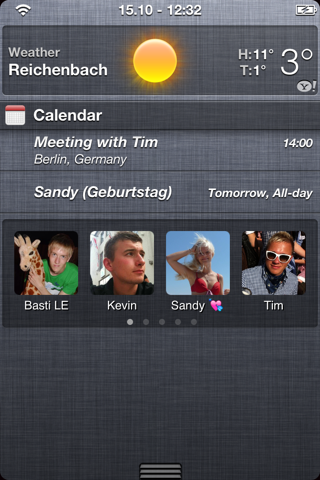 Favorite Contacts bringing up your contacts right in your Notification Center. Calling was never faster before this widget. 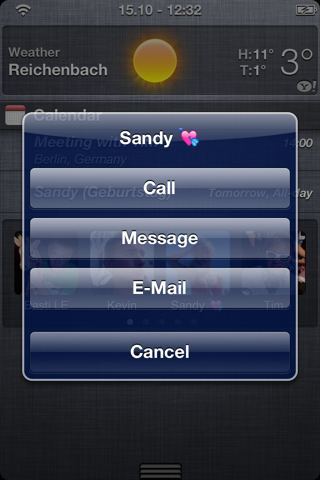 It displays your favorite speed dial contacts from your telephone application. You can display the names and the contacts pictures of your prefered contacts. After touching them you can decide if you want to call, write a message or an e-mail. Get the fastest way of calling now! WeeRadio is a smart iOS 5 Notification Center PlugIn, which let's you hear your favorite radio stream right on your iPhone, iPad or iPod Touch. You haven't seen an easier to use radio player yet! If you love listening radio, you will sure love WeeRadio. 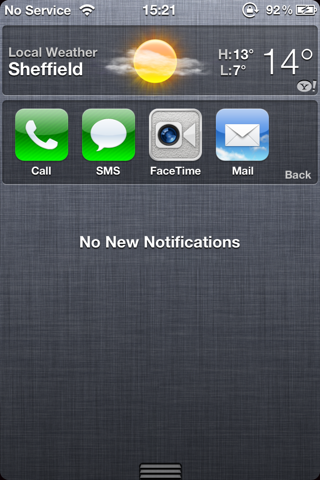 The notification center makes it easy accessible from any view on your iDevice. 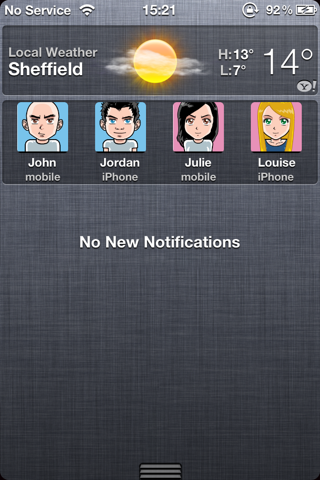 Keep your favourite contacts on the iOS5 Notification Centre using WeeSpeeddial. Simply tap them to quickly and easily call your friends. Once installed make sure to enable it the Notifications section in Settings.app. Multitasking in the notification center! Access the AppSwitcher from the drop-down easier. NotificationCenter Enhancer adds useful tweaks that willÂ EnhanceÂ your user experience. You can modify the default number of visible lines in NotificationCenter messages from 2, all the way up to 11. This allows you read most emails without opening your Mail.app . Another ability Enhancer has is an option to activate 1 Touch Clear of Messages, no need to Touch the X then Hit Clear, it's already activated for you. More Enhancements coming soon !, Get it while it's cheap.